The Institute of Chartered Accountants of India ICAI is announced a ICAI E learning Portal. The ICAI Cloud Campus is a new era of education system for CA Students. ICAI Cloud campus provides e learning, recorded webcasts, BOS Knowledge portal, Video Lectures, audio lectures and Web Casts. The ICAI Cloud campus s implies the learning management system for CA Students. Students can login to the ICAI Cloud campus through the official website of icai.org. Using the ICAI Cloud campus students can assess the free online video lecturers. ICAI Cloud campus is present by the Studentlms data operating System. Students need to register for the ICAI Cloud campus to listen the Poadcast video lecturers. ICAI E learning portal is started to friendly education to the CA Students. Many questions raised against the ICAI Cloud campus for providing only online mentoring. ICAI campus makes the some provisions to the download the ICAI Cloud campus video lecturers. Students should aware of the present ICAI Syllabus and keeping view of this syllabus and exam pattern students prepare for the CA Exams. ICAI Cloud campus enables to mentoring the online free video lectures. students we provide the detailed information about the ICAI Cloud campus Mentoring Process. CA Students need to registration for the ICAI Cloud campus with ” Student Registration Number “. Students need to enter the Student Name as on the student Registration Form. Create Password with 10 to 12 Character’s. Once again confirm the Password. Enter the general information to register for ICAI Cloud Campus.For detailed information for the ICAI Cloud campus registration is given below. Visit the Official Portal of the ICAI Cloud Campus or Click the direct link given below. Select the E Learning Option. Select the Create Account Tab. Enter the CA Students Registration Number and Student Name. Create Password and Re enter Password For conformation. Enter the Email ID of the CA Student. Fill the Street Address, City and Post Code. Select the Country and State Details. 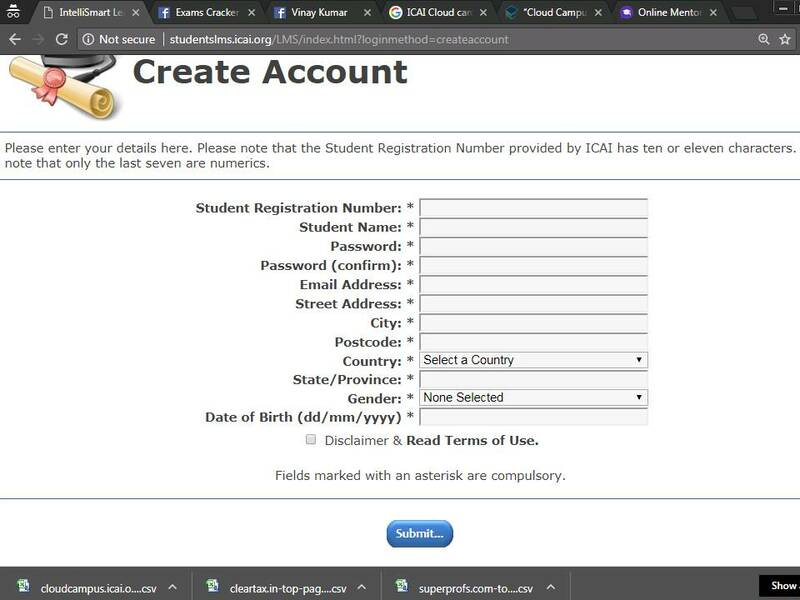 Select the Gender and Enter the Date of Birth as on the Students Registration Form. Click on the Disclaimer for Terms and Conditions of the ICAI Cloud Campus. Cloud campus provides the Recorded Webcasts of all the latest Announcements and ICAI Events across the World. The Main vision of the Recorded Webcasts is provide all the Information about the Latest Events regarding the CA Programmes. Through Following the Recorded Webcasts get latest events of the CA Conferences. Now ICAI Recorded Webcasts Deals with the Refresher Course on GST, Filing Income Tax Returns, Revised Scheme Education and Training, How to Face Interview…etc. Latest Updates of Cloud Campus of Recorded Webcasts Refer the below given description. Bos Knowledge Portal Provides the PDF of Common Proficiency Test (CPT) Books. CA Students can refer the all CA Books For CPT, IPCC, ATC and CA Final Course. Students can get suggest with some of the CA CPT, IPCC and CA Final Bos Knowledge Portal For reference of the best PDF Books. Here we provide all the E Books For the CA CPT ( Common Proficiency Test). Get Followed with the below given descriptions For the CA CPT, IPCC & CA Final e books.